Scooter riders often get the bum end of the deal when it comes to tyre choice, or at least they used to. With scooter capacities getting larger all the time firms like Dunlop are starting to realise that our smaller tyres have to work harder than larger motorcycle wheels to cover the same distance. 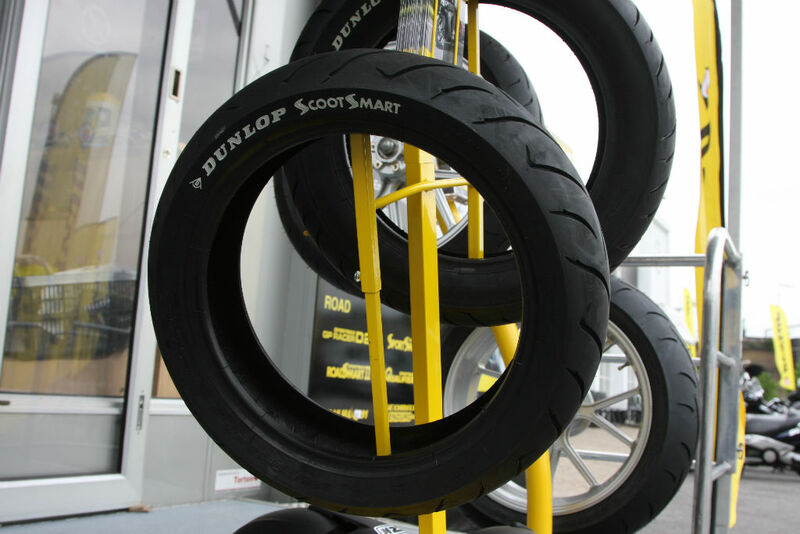 Dunlop are a huge global concern who have honed their skills on racetracks around the world at every level of two, three, four and even eighteen wheeler racing. The knowledge and feedback about compounds, tread patterns, water dispersion, wear rates, grip etc. is invaluable and eventually filters down to us on the road. A while ago we were invited down to the Ace Cafe in London to give their ScootSmart tyres a bit of a workout. It’s not easy to test and evaluate a tyre, although it is quite easy to tell the difference between a good and a bad tyre on the road, or to see which compound/tread pattern you’re comfortable with. To try and let us get a feel for the tyre in extreme circumstances Dunlop had enlisted the help of European stunt champion and movie stunt double, Craig Jones. 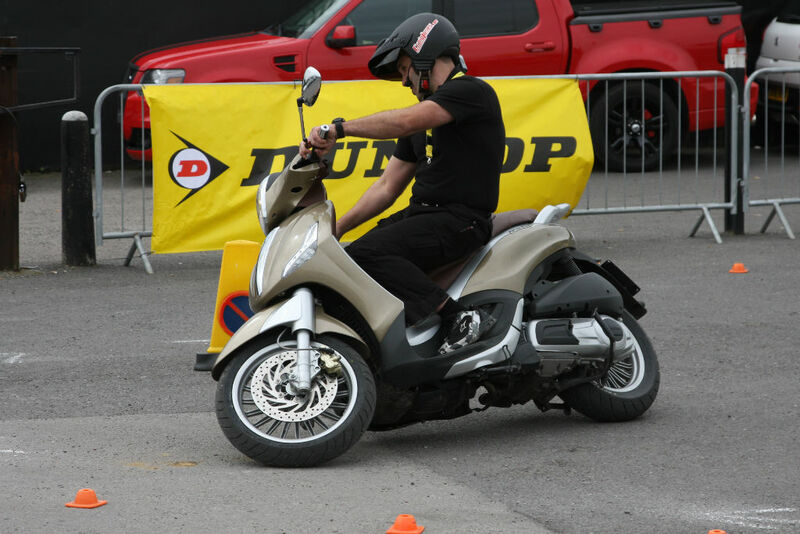 When we arrived at the famous London bikers haunt Craig had already laid out a coned section of the car park in MotoGymkhana style for his ‘Urban Challenge’ complete with tight and twisty rotations around cones and sweeping bends between obstacles. 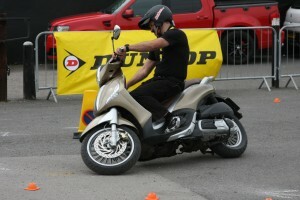 He also had a Piaggio Beverly 300 fitted with the new ScootSmart tyres and a stopwatch. Craig was busy showing of his skills and the extreme angles of lean a scooter can cope with whilst negotiating the course, simultaneously commentating on his own ride and what was happening beneath him through an intercom. His use of body positioning and of course his two wheeled skills were blatantly apparent as he blasted his way around the course in what looked like total control, whilst chatting away. Before battle could commence on the ‘Urban Challenge’ we were sent off on a lap of the ‘Guinness TT’ a 2.5 mile circuit around the North Circular on board a ScootSmart equipped Suzuki Burgman and a Yamaha T-Max. I must admit that despite only having a few minutes on the new tyres I was impressed at just how good they felt beneath me. Time to get kitted up and try to look impressive on the test track. Although Craig was riding the track (well car park) in a t-shirt and open faced helmet I went for the safer full kit route. After a couple of familiarisation laps the stopwatch came out and things got a bit more serious. The tyres felt as good as anything I’ve ridden a scooter on, they gripped very well, felt safe at extreme lean angles and they worked perfectly during heavy braking, even whilst trying to get the back end a bit loose to skid sideways for the final turn, the slide was controlled and predictable. My quickest lap was a 26.57 (Craig was down into the 24’s) and I thought I’d try something more familiar to compare things. I’ve covered thousands of miles on my own Vespa GTS 300; the Vespa shares the same engine as the Beverly, so was close on performance. 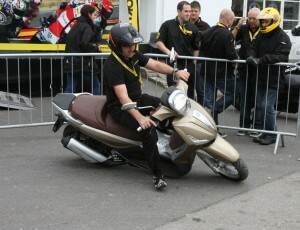 I was also used to it’s tyres and handling, so I thought I’d easily beat my best time on the more familiar scooter. I gave it all I had but only managed a 26.57 second lap, which was quite a surprise to me but a great boost for the Dunlop folk. I went straight back out on the Beverly and improved my previous best time, getting it down to a 25.81 within three laps, proof of the ScootSmarts credentials as far as I’m concerned. Craig wasn’t content with his times either and managed to drop his to an impressive 23.35. The tyres are built using a special mixing process to blend the ‘New-generation functionalised polymers, silica and coupling agent’ to provide a carbon black, ultra fine compound. The ingredients and blending technique improves the ScootSmart consistency, gives them better overall performance and they’ll last longer thanks to better silica dispersion, they do actually feel different to the touch than lesser equipped tyres. 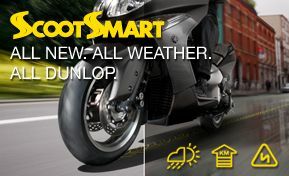 “We designed the new ScootSmart to withstand the demands of the modern scooter rider,” says Patrice Omont, Dunlop Research and Development Director. “This is why we have introduced silica tread compound technology, which reduces the rolling resistance whilst increasing wet grip. In tyre production it is revolutionary because you get increased performance and efficiency at the same time.” Tread pattern is very important too, so Dunlop adapted what they’d learnt from the bike ‘RoadSmart’ to give the new tyre a higher land to sea (grooves equate to ‘sea’, tread blocks are the ‘land’) groove distribution to improve performance in the wet whilst maintaining grip at extreme lean angles. The tyres have a speed rating of up to 131mph (depending on size) and cover most popular sizes from 10”-16”. They’re also available in both radial and cross ply to suit different machines. Tuned classic scooter riders will appreciate the 3.50-10” tyres with a 93mph (P) speed rating, as will modern Vespa GTS riders because the popular 120 and 130/70-12” tyres also come with the same rating and cost around £40-45. Dunlop are giving away a pair of ScootSmart tyres in our free to enter competition. To be in with a chance of winning just tweet @2Commute, or message 2Commute on Facebook and tell us what speed rating a Vespa GTS ScootSmart achieves. We’ll pick a winner at random after the December 1st closing date. Competition open to UK residents only.